With the theme of “It’s About People,” Jeff Balser M.D., Ph.D., President and CEO of Vanderbilt University Medical Center and Dean of Vanderbilt University School of Medicine, began the Summer Clinical Enterprise Leadership Assembly by urging nearly 1,000 Medical Center leaders in attendance in Langford Auditorium to consider the emotional needs of members of their teams. In particular, he asked leaders to recognize the psychological impact of recent tragic events happening across the U.S. and in other nations. Balser said these events are traumatic for everyone, creating even greater stress for people who closely identify with those impacted, whether through race, religion, sexual orientation or profession. He encouraged everyone attending to open a dialogue with colleagues as a way to help them cope with the impact of these tragedies. “In the wake of the recent tragic and traumatic events in Dallas, Orlando, Paris and elsewhere, people are hurting. VUMC is no exception. That’s why it’s important for leaders to connect emotionally with the members of our teams. We need to understand when our own people are in pain,” Balser said. Wednesday’s assembly continued to reflect the four key priorities that Balser said will guide VUMC into the future. These themes include new ways of addressing workforce engagement, such as the recruitment of “lean teams” of stakeholders from broad areas of the organization to tackle short-term challenges, and through plotting out VUMC’s longer-term strategic directions. Balser plans to report back on conclusions from the Medical Center’s strategic planning effort in November. The roll-out of Epic Leap, VUMC’s transition to a new clinical software system, will continue to be a priority, as will the strategic growth of the Vanderbilt Health Affiliated Network to serve Tennessee and the wider Southeast region. The fourth priority, academic performance, will manifest in new ways such as an effort to increase the involvement of patient care centers in clinical research. “Marketing data tell us that patients want care at the places that are doing research and can offer the most cutting-edge options,” Balser explained. Clinical studies also create an atmosphere of “questioning” that is healthy for clinical care. Increasing diversity across VUMC is also vital to its future, Balser said. “The diversity of the Medical Center’s leadership needs to better reflect its own workforce and that of the community it serves. We can’t fully understand our patients and we can’t fully understand our workforce unless our leadership team is equally representative,” he said. Balser noted that Andre Churchwell, M.D., was recently appointed as the Medical Center’s first Chief Diversity Officer. In this new role Churchwell will continue to oversee the Office for Diversity Affairs, which will have a continued vital role in Vanderbilt University School of Medicine, while also engaging with other leaders across VUMC to create new opportunities that will increase diversity and inclusion throughout the organization. 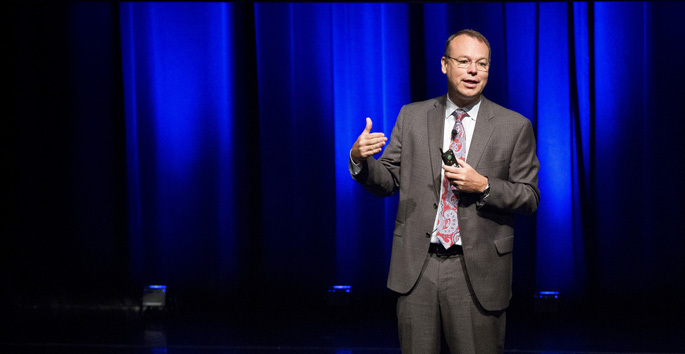 The assembly’s emphasis on the Medical Center’s people continued through the presentation of C. Wright Pinson, MBA, M.D., Deputy CEO and Chief Health System Officer, in his quarterly Pillar update and comments about the results of VUMC’s Culture Survey. “Never underestimate the impact that you personally can make with a single word or a single act,” Pinson said. The commitment of VUMC’s employees to service and quality is reflected by a dramatic drop in hospital-acquired infections, as well as through the Medical Center’s performance in this year’s U.S. News and World Report’s Best Hospitals rankings. The Medical Center’s improving performance is also reflected in the results of the Culture Survey, which saw gains in employees’ workplace satisfaction and overall engagement. “For the first time, we combined our survey process to include three surveys — our culture survey along with a Quality and Safety survey and a Magnet nursing survey to learn more about what our people are thinking. We did this because the data tell us that team engagement, safety, nursing excellence and patient satisfaction are all directly correlated,” he said. Pinson said while the results are affirming, more needs to be done and urged the audience to start now to develop their own personal plans for how they’re going to contribute this year. During his remarks Pinson spoke about the adjustment to the Medical Center’s PTO policy that will offer employees the opportunity to roll forward up to 40 hours of unused PTO time from the current fiscal into fiscal year 2018 to be used as sick time. Also during the Leadership Assembly, the Five-Pillar Leader Award and three Credo Awards were presented to employees who exemplify VUMC’s culture of commitment to their patients, their colleagues and to the organization. Country music singer Steve Wariner sang “Life’s Highway,” and Barbara Reilly, Ph.D., senior vice president for employee, nurse and physician engagement for the health care consulting firm Press Ganey, gave the keynote address. During her half-hour address, Reilly shared the evidence that engagement works. “When you are more engaged, and when you show up, when you’re passionate, patient care is better,” she said. Higher engagement, as measured by surveys, translates into shorter waiting times for urgent heart procedures, fewer hospital-acquired infections, increased employee productivity and retention, and a savings that, for a medical center the size of VUMC, translates into $50 million a year. Approximately 500 leaders attended a post assembly breakout session where they were able to log in with their laptops or iPads and see their Culture Survey results for the first time.